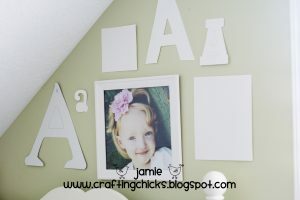 I am SOOOOO excited to share this DIY Kid Room Decor-Monogram Photo Wall with you. My 3 1/2 year old twins recently moved into the same room (to make room for babies). I needed some fun wall art for above their beds. I needed it to coordinate, not be too girly or too boyish, and not be too expensive. I had a really fun time creating this easy to do, monogram photo wall. 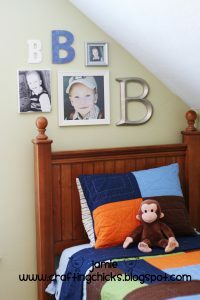 Step 1: Gather frames, photos and letters that coordinate with your bedding, pillows and other decor. 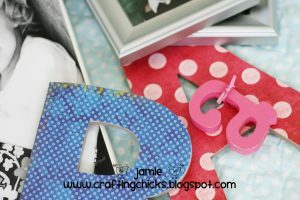 I found chipboard letters, wooden letters and metal letters. I rounded up frames that I already had and was about to give away. I also used Mod Podge to create a 8×10 photo canvas. Much less expensive than ordering a wrapped photo canvas. I wanted this to be very cute and very inexpensive because we weren’t sure how long A & B could last in the same room (we have already had many 4 am room parties and midnight roamers-but it is getting better! Hallelujah!) 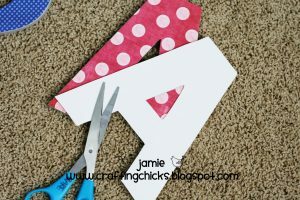 Step 2: Trace your letters and frames onto paper and cut out the patterns. 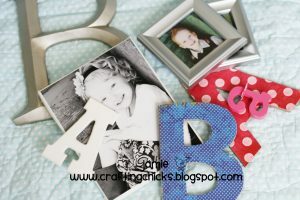 Step 3: Use the paper letters and frames to move around and position your photo wall. I moved these patterns around several times until I found a good fit. You can’t really mess up-I found that there were a few different ways to place the letters and frames and they all looked great. 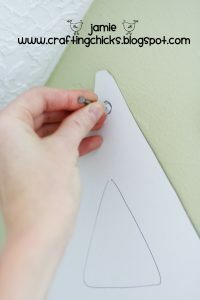 Step 4: Hammer your nails in the correct spot on your paper pattern-so that all you have to do in remove the paper and hang your letters and photos on the nails. Step 5: Hang those photos and letters! I have to say, these photo walls were a huge hit with my kiddos. They loved having “their special letter” above their beds, as well as photos of themselves! 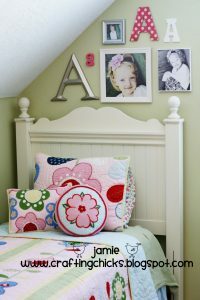 Very cute and an inexpensive way to spruce up a child’s room. 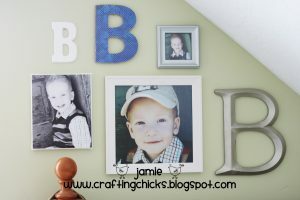 It would also be fun to create a photo wall in your family room with family photos. I’d love to see photos of your Monogram photo walls! Also, Check out Crafting Chick Kirsten’s Awesome Photo Wall that she created for her entryway last year. What a fun and adorable idea!! It looks great and I love the tip about positioning the paper shapes so it’s really easy to put the nails in. Love it! Thank you! I got the girl bedding from Pottery Barn Kids. It is called Abby bedding-which is fun because my little girl’s name is Abby. I bought the boy bedding at Target! Thanks! Adorable! Where did you find those metal letters? They’re so perfect. Thanks so much! 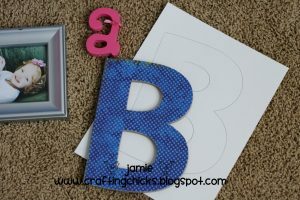 I got the big metal like letters at Hobby Lobby-They are actually resin letters that I spray painted silver. I am LOVIN’ this!! I’ll be featuring today. I had a blast meeting you crafty chicks!! Thank you for featuring us! I loved meeting you too Kari! So cute! And, you crafty gal, you made the arrangement look awesome on angled walls that I would have pulled my hair out trying to figure out what would fit up there! i LOVE this idea!! we just put my son and daughter in the same room last week, and i’ve been looking for decorating ideas!!! thanks for sharing! What a great idea! My sister has three kids. Girl, boy, girl and she’s thought about putting them all in one room so she can have a play room but she’s a little uncertain on how to go about giving them their own little space. Especially with her son. This is a great solution! I have 5 boys. The 10 year old and 9 year old share a room with bunks so do the 6 year old and two year old. What a great way to personalize their little nook!!! The baby is in his own room and I was looking for just the right wall decor for the wall where his crib is! Sorry to go on but I love that this is personal and yet still uniform. I love it! Thanks for sharing!! I’m so glad you like it Cristina! If you end up making the monogram wall, I’d love to see it! So cute Jamie!!! I want to do this in my girl’s rooms! LOVE this idea! I’ll be remember it. I am definitely doing this!! Thanks for the inspiration! LOVE this idea. I have twin girls who just turned 3 and I have a letter for each of them…but, now I am going to get more and some fun pictures printed. Thank you! Really cute…love your blog! This is beautiful!! Unique too!! I featured this on my friday favorites!! I love it!! I plan on doing this above my little girls bed now! But what is that wall color?? I’ve been looking for a good green but can’t find one I like, but I really like the color of your walls. Do you remember the name? Benjamin More and Pottery Barn have a nice green called “Kittery Point Green” HC-19… This room looks like its the same color as my girls room, and we used Kittery Point Green… Check it out. I love this it is adorbale I am going to use this in my daughter’s room. 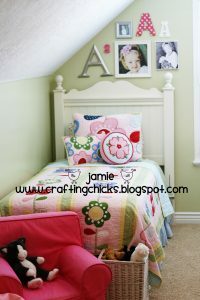 I would love to kno where you got your daughter’s bedding from my daughter would love it. Sorry about the typo’s I tried to fix them and was not quick enough. 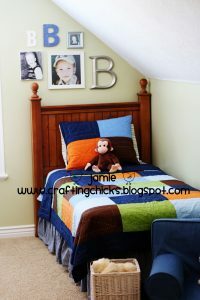 This is a wonderful way to make their bedroom soooo cute! Thanks for sharing! Also, just wondering where you got their beds? They are to die for! I love this! (I discovered you through Kristen Duke’s decorating with portraits link-up!